On the global warming "pause"
It certainly is possible for the oceans to continue warming while measured surface temperature remains relatively constant, but that's not what the theory is about! Oceanic warming is not being proposed as an explanation for the global warming pause, because in reality there is no global warming pause that needs explaining. The alleged "global warming pause" hype is an example of what is actually an excruciatingly common logical fallacy whereby people argue on the basis of perceived structural breaks in time trends which are really just white noise. It's a fallacy that's extremely familiar to macroeconomists, who spend their days staring at time-series data not unlike the global temperature data. The fact is that when you have a time-series that follows a statistical process known as a "random walk," deviations from the long-run trend are likely, large, and long-lasting. As I explained in a post about the stock market, a random walk with drift has a clear directionality--to move in the direction of the drift term--but no inherent tendency to regress to a One True Trend line. The fallacy is this: people think that if global warming is real, then being below the historical trend should make a temperature increase over the next year more likely. Hence, the longer we remain below trend, the less likely it is that global warming is real. This is true of many data generating processes that are not random walks, but the existence of random walks proves that this type of reasoning is fallacious--in a random walk, being below the perceived time-trend this year has no impact on the probability of a temperature rise next year whatsoever (see unit root hypothesis). That temperature rise follows a random walk with drift is almost surely the case. Because, what's the mechanism for the presumed regression to the mean? The earth's atmosphere either traps more of the sun's heat this year or it doesn't. There's a lot of reasons why it might not--perhaps cloud cover has incidentally reflected more light than usual, or maybe sunspots or other solar activity have reduced the amount of light radiating towards earth. Whatever the reason, one thing is clear: there is no particular reason to expect the environment to compensate next year--lower than average solar energy this year does not imply that next year we'll have higher than average solar activity! That is what it means to be a random walk. It does not contradict global warming at all--on average, temperatures are rising 0.03C per year and those increases are permanent, but also stochastic. 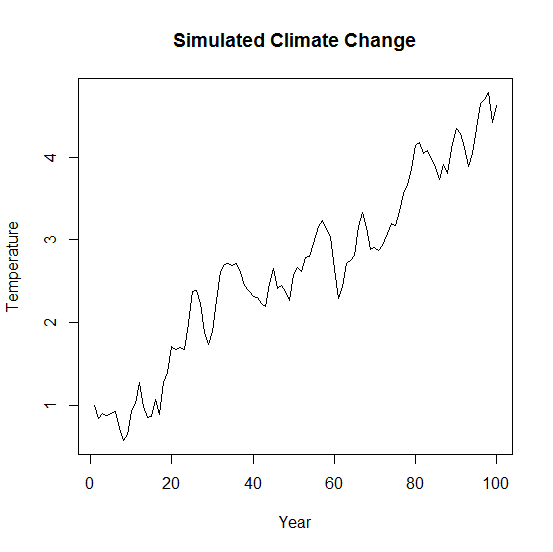 A simulated century of climate change. Notice that if you were an observer in, say, year 50 of the graph above, it would appear that global warming had "paused" over the previous 20 years. But it didn't! We know it didn't because we controlled the time series process. With a random walk, such deviations from perceived trends are likely, and imply nothing about the veracity of global warming. Summary statistics showing how often perceived 10-year "pauses" might occur in a global warming process with no structural breaks. As you can see, on average we could expect to see false global warming "pauses," like the one commentators are currently debating, about 15 times every 90 years. Almost 17 percent of the time it will look like global warming has "paused" over the previous decade, even though there were no actual structural breaks in any of these simulations! So, I'm labeling this the structural break fallacy. When someone argues that there's been a structural break in a time-series like global mean temperature data, challenge them--their logic is incomplete unless they can first establish that the time-series should exhibit regression to the mean. If not, then large and persistent deviations from "trend" are not only possible, but likely.